Two Persons, two courses each, one bottle of house wine, plus coffee or tea for only £25 in total. The price sounded good and the restaurant, the Glassboat, was one of my favourites in Bristol. An opportunity such as this was not to be missed so my friend Paul and I headed down to the Welsh Back around 6.30 on Tuesday evening. We had not reserved a place but a table with a view of the water was found for us and we were seated quite promptly. The early bird menu had three of each of starters, mains and desserts so the selection was quite small. I opted for the dill gravidlax starter, we both ordered the whole roasted mackerel main, and Paul chose the chocolate and star anise truffle cake with burnt orange syrup. 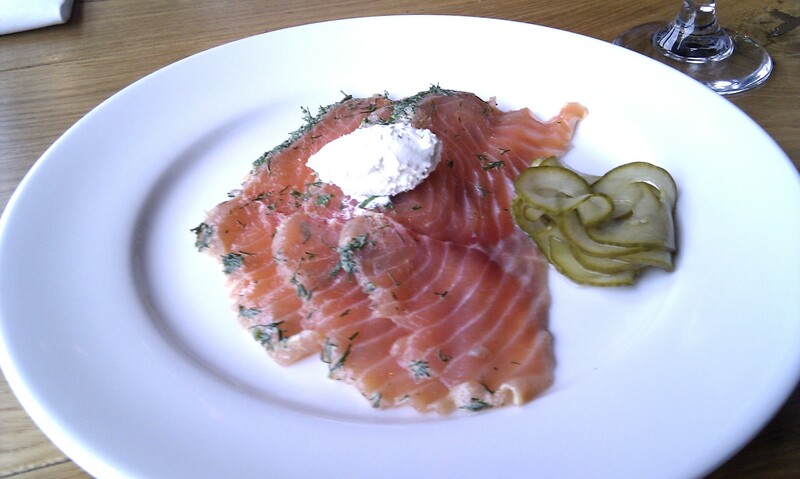 My salmon looked impressive and the dill added its distinct pine-like flavour but the pickle was not enough to lift it from its ordinary taste. The salmon wasn’t fresh or cool enough to be enjoyed on its own. Some lemon would have been a great accompaniment but the only ones to be found were in our water. 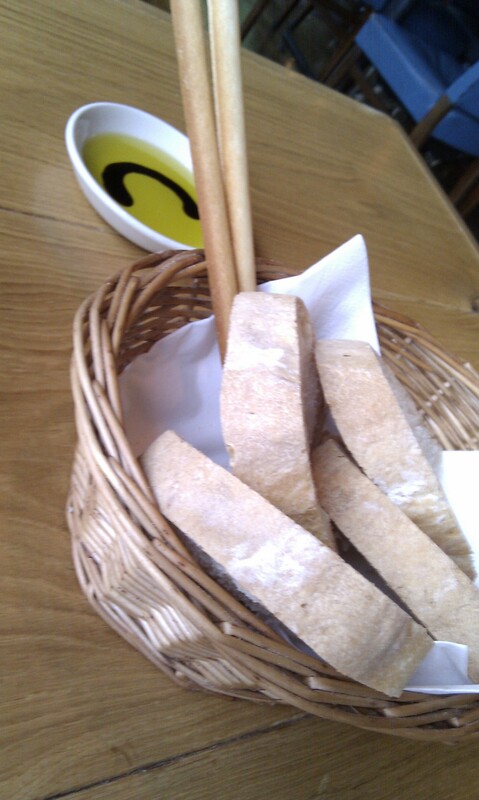 Bread slices and sticks were brought to our table with an olive oil and balsamic dip. The balsamic vinegar was thick and sticky and the olive oil a bright yellow. It was a nice addition and the bread was soft and alright. 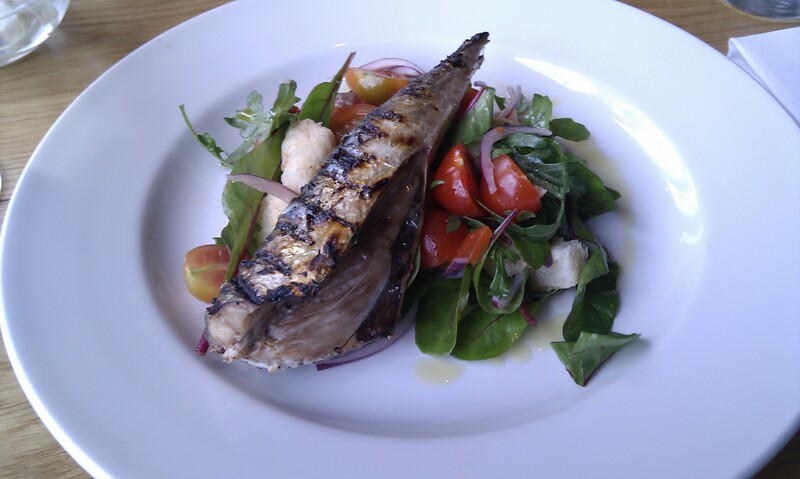 The mackerel was nicely roasted and while the flesh was soft, again, there was a real lack of lemon or dressing to lift up the flavours. The abundance of bones didn’t help but its hard to complain about that as the fish was served whole, though headless, on a bed of panzanella. The panzanella salad was delicious and easily the best part of my meal. Cherry tomatoes combined with roasted red pepper, sweet red onions, capers, small bits of bread and an oil and vinegar dressing to provide a fresh yet flavoursome accompaniment to the fish. All the tanginess that was missing from the other food seemed to have found itself here. 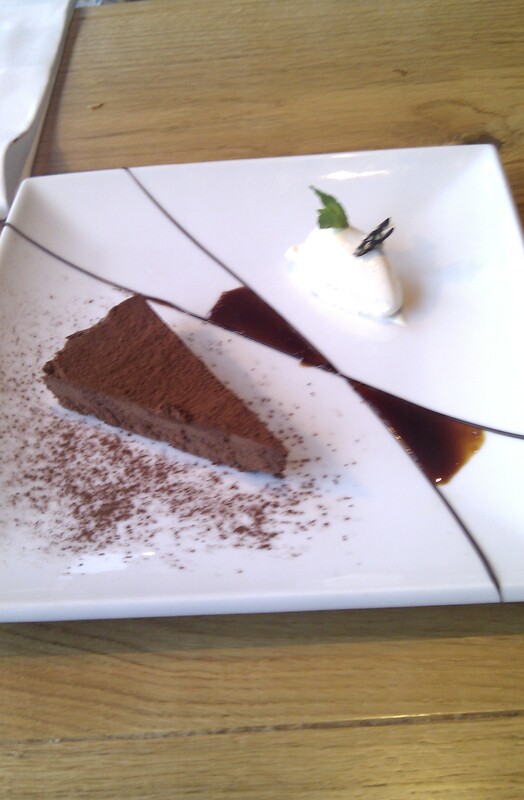 I did not try any of the dessert but was told that it was very tasty. The chocolate and star anise truffle cake looked incredible and Paul seemed to enjoy it all. The burnt orange sauce was served alongside the cake and next to the cream. The dinner was quite nice but it wasn’t the amazing experience I am used to so I came away mildly unimpressed. 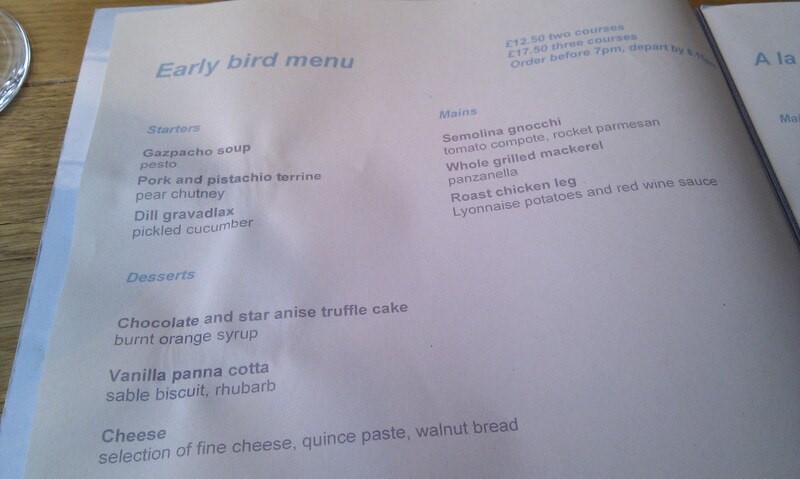 The a la carte menu looked quite appetizing so it may still be a treat for the non-early bird diners. The view, as always, was a treat and we even managed to see a swan swim by. 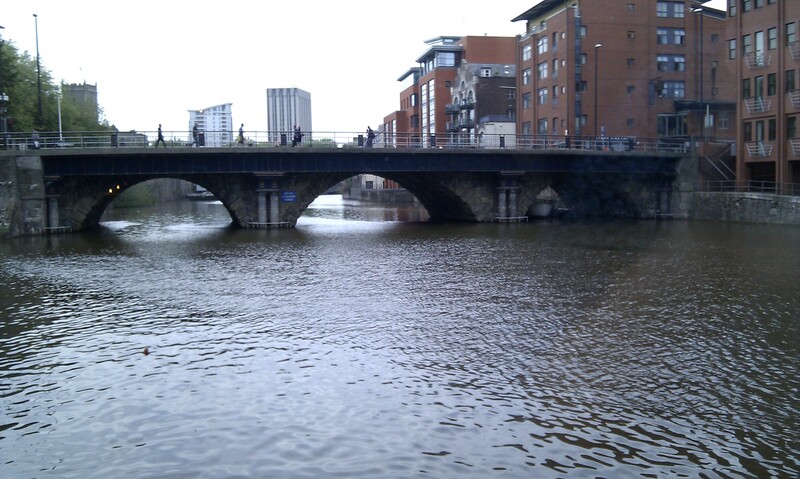 I had promised Paul many swans but instead we were treated to many rowers passing by and past Bristol Bridge. It’s not really a complaint that you’re hearing, to quote Leonard Cohen, because it’s hard to not enjoy a trip to the Glassboat. I was not as amazed at the dinner as I have been in the past. I still recommend the restaurant but maybe not as enthusiastically as usual. The menu changes often, however, so I’ll have to let you know what I think of my next visit. There will definitely be a next visit. This entry was posted in Bristol, Food and tagged "Bristol things to do", "Bristol United Kingdom", Bristol, dinner, Food, Glassboat, Welsh Back. Bookmark the permalink. Went there for the first time with the missus for our anniversary the other day, ate off the à la carte, and we were both very impressed with it. Starters (asparagus, mackerel) that whetted the appetite but didn’t bloat you up, nice balance of flavours in the mains (risotto and duck) that were excellently presented, and delicious puds (that lovely star anise truffle cake and a raspberry sorbet). Everything arrived promptly, the waiting staff were very friendly, helpful, and always on hand when we needed them (but without crowding us), and it was just a very enjoyable meal. I hope your next visit will be as enjoyable as our first! Your experience sounds wonderful and more of what I’m used to at the Glassboat. It’s one of my favourites and I was surprised, to say the least, at the latest visit. The service was excellent. Went for the ‘Soul Food Brunch’ on Sunday, having enjoyed some great dinners at the Glassboat in the past. Not hugely impressed. Indifferent service, lack of atmosphere, and underdone poached eggs. Spyglass, The Apple and the Grain Barge all looked much more buzzing when we walked past afterwards – possibly the ‘Boat has had its day?